The warm, wine-scented froth we call zabaglione may be the only dish made of whipped egg yolks. I don't know of another. Because egg yolks harden quickly over strong heat, it is easier to make zabaglione off direct heat in a double boiler, as in the instructions that follow. If, however, you know how to control this kind of cooking, you can do it directly over the flame, possibly using the traditional round-bottomed, unlined copper [%amazonProductLink "zabaglione pot" asin=B000AMZMIS]. Put the egg yolks and sugar in the top of a double boiler (see Note, below) and whip the yolks with a whisk or electric mixer until they are pale yellow and creamy. Put water in the bottom of the double boiler and bring it to the brink of a simmer. Fit the two double-boiler pans together. Add the Marsala, beating constantly. The mixture will begin to foam, then swell into a soft, frothy mass. The zabaglione is ready in 15 minutes or less, when it has formed soft mounds. Zabaglione is usually served warm, spooned into glass cups. You can also serve it over sliced ripe fruit or with plain cakes. The egg-yolk mixture increases considerably in volume as you heat it and cook it. If your double boiler is not a large one, you'd be better off improvising one by putting one good-size pot into a larger one that contains simmering water. There are trivets made especially to support the inner pot (a useful gadget to own), but you can use any small metal trivet for the purpose. Variation: Cold Zabaglione with Red Wine Substitute 1 cup dry red wine, such as Barolo or Barbaresco, for the 1/2 cup Marsala. 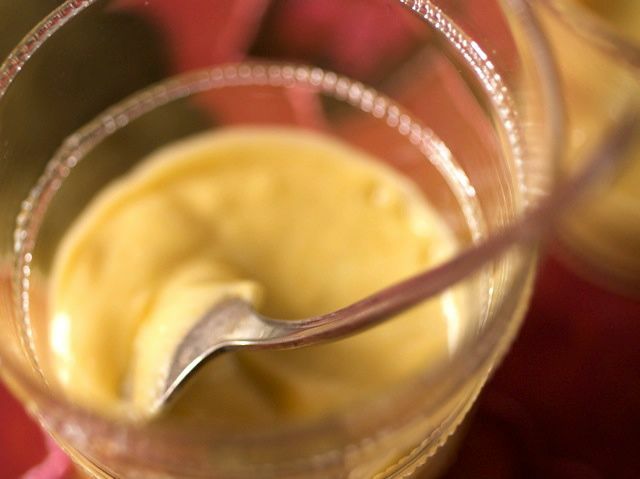 Spoon the finished zabaglione into individual serving cups and refrigerate for 4 to 6 hours before serving.